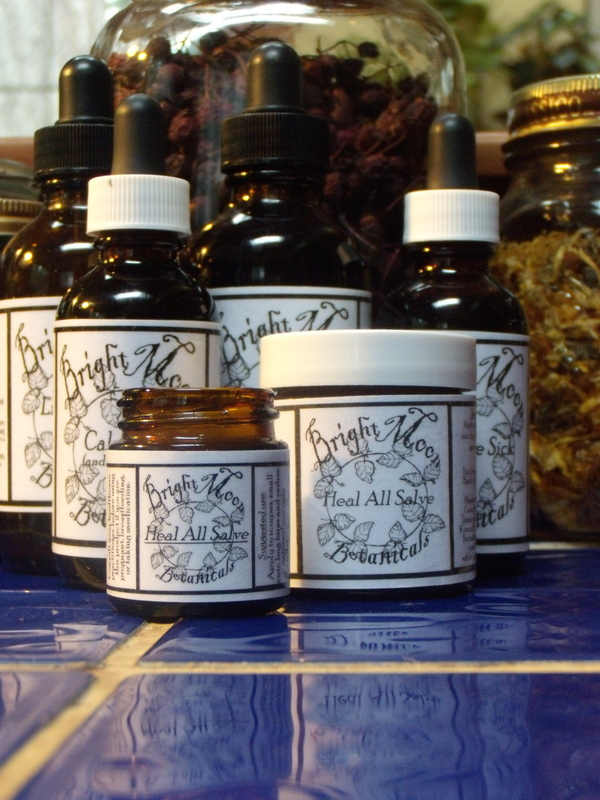 Bright Moon Botanicals are all sourced from ethical ingredients. All herbs are organic or carefully harvested, many locally. Of course, products are never tested on animals, except my children! Contains: Usnea (Usnea b. ), Blue Elderberry, (Sambucus c), Yarrow flower (Achiella), Oregon Grape root (Mahonia spp. ), Red Cedar (Thuja plicata), Turkey Tail (Trementes viscolor), Balm of Gilead (Populus nigra), gluten-free alcohol , Four Thieves essential oil. Use at the onset of cold or flu symptoms to nip the sickness in the bud. This is an anti-microbial, anti-bacterial, anti-viral formula made from local plants. Contains: Cinnamon (Cinnamomum spp), Oregon Grape root, (Mahonia spp.) Turkey rhubarb (Rhuem palmatum), Spirit of peppermint (Mentha piperita), potassium carbonate, simple syrup, gluten-free alcohol. This delicious combo, also known as Neutralizing cordial, is a traditional Ecclectic formula used for all digestive upsets; dyspepsia, gas, bloating, constipation, loose stools, diverticulitis, and slow or sluggish digestion. Contains: Red clover (Trifolium pratense), Milk Thistle (Silybum marianum), Burdock root (Arctium lappa), Dandelion root (Taraxacum officinale), Yellow Dock root (Rumex crispus). Use this combination to help cleanse the liver and the blood or, after exposure to toxins or pollutants, to help with recovery from alcohol or drug use, to help regulate hormones, to address skin eruptions and rashes and to contribute to healthy digestion by activating bile flow. Do not use if you have a liver disorder. Contains: Skullcap (Scutellaria lateriflora), Holy Basil (Ocimum sanctum), St. John’s Wort (Hypericum), Sarsaparilla (Smilax), and gluten-free alcohol. Contains: Fennel (Foeniculum), California poppy (Eschscholtzia), Skullcap (Scutelleria lateriflora), Peppermint (Mentha piperita), vegetable glycerin, and Rescue Remedy. This safe and effective remedy is handy to have on hand for all grumpy kid occasions! For upset tummies, for teething pains, for fussiness, for a refusal to fall asleep or for owchies and bonks. This is an all purpose remedy that grown-ups can also take for any of the above, or for general grouchiness. Contains: California Poppy (Eschscholtzia californica), Skullcap (Scutelleria lateriflora), Ashwaganda (Withania), Kava Kava (Piper methysticum), gluten-free alcohol and vegetable glycerine. This remedy is helpful for those who have a hard time falling asleep, or staying asleep. The gentle nervine- seditives are effective against brain chatter that keeps one awake, restlessness and anxiety. It is best to take this ½ hour before sleep and then again right before you try to fall asleep. Taking an adrenal tonic during the day will increase effectiveness. Do not take with other sleep medications. Deep Relaxation Contains: Olive oil, St. John’s Wort (Hypericum), Balm of Gilead (Populus nigra), essential oils of lavender, jasmine, sweet orange and rose wood, Rescue Remedy, Vitamin E and sunflower oil. Pain Relieving Contains: Olive oil, St. John’s Wort (Hypericum), Balm of Gilead (Populus nigra), essential oils of ginger, juniper and wintergreen, Crab Apple remedy, Vitamin E and sunflower oil. The beautiful deep red of this massage oil is due to the St. John’s Wort flower. This flower is helpful as an anti-inflammatory, reducing pain and swelling from arthritis or injuries and helps with nerve pain. The sweet smell is from the Balm of Gilead, extracted from the buds of the Black Cottonwood tree. Contains: Oregon Grape leaf (Mahonia), Usnea (Usnea b. ), Lavender (Lavendar), Yarrow leaf (Achiella millefolium), Calendula, Balm of Gilead (Populus nigra), Plantain (Plantago spp. ), Arnica, St. John’s Wort (Hypericum), Olive oil, Vitamin E, bee pollen, bees wax and Lavender essential oil. This all purpose salve can be added to first aid kits, and is good to have on hand for skin related ailments from eczema and funny rashes to injuries like cuts and scrapes. Kids respond well to its application after bug bites and stings and, it helps to speed up the healing of scars. A good thing to have on hand. Contains: St. John’s wort (Hypericum perforatum), Comfrey Leaf (Symphytum off. ), Devil’s Club berry (Oplopanax h.), Balm of Gilead (Populus nigra), Olive oil, Bees Wax, Vitamin E, and essential oils of Juniper, Wintergreen and Cinnamon. This salve is what many people turn to for aching joints and muscles, and for arthritis, sports injuries, breaks, sprains and bruises. We also offer an extensive listing of single plant extracts and custom blending. Please get in touch for more information. Please inquire about prices for custom blends and wholesale rates. Always check with a health care practitioner before using these products if you are pregnant, breast-feeding, taking medication, have a liver disease or if you experience any unpleasant reactions. Do you ship products to Victoria? I could use some of that kick the sick stuff. sure do, but the shipping is an extra $10. I wonder if someone could bring you some down? Feel free to call or email and we can figure it out! Best health to you!